Rated 5 out of 5 by ckuno24 from The best router I have ever owned I bought this Router from amazon.com a month and a half ago and unfortunately after some time using it I had serious problems with it and contacted Linksys support line for help, and they were so nice and professional in resolving my issue that after several attempts to fix my Router they decided to send me a new one, I am so very happy with this Router because it is one of the best I have ever seen, Linksys is my preferred router ever since I can remember but this one is just top of the line and I am very impressed with the signal level in my home, it covers very easily approx. 4000sqf. I highly recommend this item to anyone that needs a real power house of a router. it is the best. Rated 5 out of 5 by Water head from WRT3200ACM MU-MIMO Gigabit Router Review Previous to installing this wireless router on my home network I was using a Cisco Valet 20 Plus. As I needed a better performing router to connect my nine wireless devices I installed this beast on my network and WOW!!!! Setup was not difficult at all and it took me fifteen minutes to set up and change my password along with logging on my other devises. The Smart Wi-Fi App is a welcome advantage also. No more buffering and my devices stay connected! My Smart TV just loves this new router viewing is a pleasure no buffering or dropping of the connection. As I pull into my driveway my android phone connects to my network from a 125 feet away! Linksys did a nice job on this router I would strongly recommend this router for anyone needing the power to connect and stay connected using numerous devices. Rated 5 out of 5 by DocStone from Linksys WRT3200ACM MU-MIMO Gigait Wi-Fi Router Worth the money. Easy install with the "Wizard". Unbelievable speed increase. My old Linksys router was choking my network. Before updating to the WRT3200 I was getting 38.87 Mbps Download and 21.57 Mbps Upload. After installing the WRT3200 I'm getting 216.55 Mbps Download and 22.52 Mbps Upload. I also like that the WRT3200 is designed to handle multiple users at the same time without dropping speed or users. I haven't had any problems with this. I like being able to sign into the WRT3200 from anywhere on my Android phone to control my network users remotely. I have several computers, printers, 3 Xbox, 4 DVRs, 3 Blu-Rays, 2 Internet phones, 2 Smart TVS, security cameras, and our family stream different movies at the same time without any digital distortion. The WRT3200 handles all of this load with ease !! Even the clarity improved to the HD cable TVs. reception. Rated 5 out of 5 by billr920 from Very Reliable I have had this for approx. 2 weeks and so far, everything stays connected. Set up was a breeze through my browser. The Router Auto updated and auto connected to my devices. I have a total of 12 devices, smart phones, TV's, Laptops, desktop, 2 printers, My Cloud, Rokus etc...The AC Wireless devices stay connected at a full 866.7 mbps. Also connected to my ac wireless Linksys range extender with no trouble. So far, has been a good performer with no down time. I normally will manually tweak the settings in the router but have found no need to with this particular router. Streaming movies such has Netflix was smooth. You will not be disappointed! Rated 1 out of 5 by Ryan from Stay Away This router worked fine for me for a couple months, not great (for how much it cost) but it was okay. Then a firmware update was pushed that broke the router, it's not worth the hassle, time and energy to buy this. Look elsewhere for your routing needs. The customer service is terrible, I would rather just have money back but instead I'm taking a chance on a different router. 5Ghz and 2.4Ghz wifi drops constantly, the coverage in my 900 square feet apartment is spotty when more than 5 feet from the router. It's just not a great router and is priced far higher than what it should considering how poorly it works. Stay away unless you want to waste hours of your life with technical support. Rated 1 out of 5 by jmcintex from No technical support for over 11 days. I purchased router and modem from Linksys site in January 2017. After 10 months, router connectivity is dropping up to 10X per day. I have contacted Linksys help and am still waiting for resolution for over 11 days. In the meantime, my home office productivity is poor, my home security and other home automation items are down. My cell phone charges are building due to no wifi. I have done everything Linksys requests and maintained detailed logs. All help desk personnel and technicians are pleasant and tell me they understand my frustration. However, I still have an expensive router with unreliable service. I expected better from Linksys. Rated 5 out of 5 by Denny from Great Router with nice features and great Looks. I received this router in exchange for my honest opinion. As always with Linksys routers it was very easy to setup, I set the router in a repeater mode and it has been running perfectly with no drops or hiccups at all, Very fast, very stable! This router helps me extend my network even further, I really love it, and of course it looks beautiful, the only thing I can say is maybe a con is the power brick is pretty big, but really that is no big deal unless you are using a power strip and you have little space. If your a fan of the WRT line of routers then you can't go wrong with this router. Rated 1 out of 5 by samtrain from Half speed I got the 3200ACM after reading rave reviews and articles. I'm disappointed. I have a $80 Netgear N750 that is giving me straight-from-modem speeds of 100-130 mbps when wired, and about a 10 mbps loss to around 90 mbps on wifi, depending on distance. The Linksys gave me half of these speeds, ethernet cable or wifi. I spent hours with Linksys support, who did try hard to solve the issue, but ultimately told me the router was defective and that there was no other reason why the router would be giving me half-speed. Disappointing, especially considering the price point. I took the router back though Linksys did offer to have me ship it in for warranty work. Nah...I think not. I'll stick with my working out of the box Netgear. Rated 1 out of 5 by maxxitout from Would not keep a wireless connection I bought this router due to the great specs and many good reviews. After install things changed. I spent two days frustrated on why it would not open certain web pages and would keep dropping the wireless connection about every 15 min and then maybe auto reconnect, sometimes needing a power cycle to restore. LAN was rock solid and always connected. This mystery had me call the tech support, with though was friendly was no help at all. They kept insisting I needed to restore factory defaults and I kept telling them it is brand new and that is not a solution. I tried updating latest firmware and then reverting, no fix. All in all it was a very depressing and time wasting experience and I have returned the router to the place of purchase. I hooked up my old N600 while I wait for a different router to be shipped and my wireless has not skipped a beat! Until they work the bugs out of this model I stay steer clear of it at all costs! Rated 3 out of 5 by Randy from Firmware out of date for Windows 10 I have had this router for over a year now and it has worked wonderfully. Just recently I purchased a 6TB drive to attach to the router as a file sharing drive on my wireless system. Windows 10 could not access the drive because Windows 10 has stopped using the 30 year old SMB1 protocol because it is not secure. In todays cyber world, security requires a new standard. I haven't found any firmware updates to this router that used SMB2. Will have to wait to see if Linksys will update the firmware beyond the current Ver 1.0 on their web site. You will be happy with this router unless you want to share a drive through this router. Rated 5 out of 5 by Margaritaville_Operations from GD Review of WRT3200ACM I installed this router approximately 3 weeks ago and have been very happy with the unit. I de-installed my old router and installed the High Gain antennas on this router. Started it up and within about 20 minutes my network was back up and fully operational. Applications which access the internet during startup and starting up faster and going thru the internet connection process quicker than before. Using IE or Chrome web browsers open to the home page and load much faster without any delays. Using wireless seems to be faster than before. To date I am very please with this router and would recommend as one to purchase. Rated 5 out of 5 by Gregss54 from Great Upgrade from WRT1900AC I was offered the option of receiving a free WRT3200ACM in exchange for a fair and accurate review of the product. I used it to replace my WRT1900AC. The installation was just as easy as my previous router. It works just as well, but also give me more range to reach the far corners of my home and into the back yard. 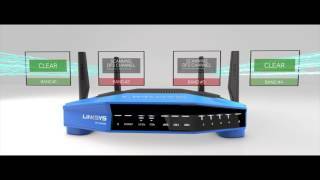 It is another great product from Linksys. The only issue I had initially having random dropped connections. After some trouble shooting, I disconnected all of the cables and reinstalled them recycled the modem and router, and the issue went away. Could have been a poorly seated connection of the Ethernet cable from the modem. All is good! Rated 5 out of 5 by Zlambe from Extremely Fast I absolutely love this router , it has been a huge improvement over my last router . So far it has been lag free even while streaming HD video on three devices simultaneously. Finding the perfect position on the external antennas was alittle tricky but they definitely help improve coverage in problem areas . Setup was easy , I would like to see a option to transfer previous wireless networks and data through the Linksys app to ease setup and prevent haven't to reenter passwords on all devices . Overall this has been the best router I have owned to this date . Rated 1 out of 5 by jcodybaker from Wifi does not work with OpenWRT / DD-WRT Both the box and this website suggest the device works with OpenWRT and DD-WRT. At present, there is no available wifi driver for the WRT3200ACM on either platform. Linksys should either release their proprietary driver (used in the stock firmware) as open source or remove these claims from the device. Rated 5 out of 5 by classicalpiano from Terrific in every way. I have been using only Linksys routers for as long as I can remember. My first one was a Linksys WRT54G I purchased around 2002 or 2003. From then on, I always upgraded to another Linksys every couple or three years. So now, I have the Linksys WRT3200ACM. I have a 2300 SF home and all my computers (three of them) and phones never have a problem finding and keeping the Wi-Fi signal. My Samsung S6 phone even remains connected to the Wi-Fi outside past the end of my driveway, about 120 feet from the router and through walls. I would never use any other router brand. Only Linksys. Rated 5 out of 5 by tim90 from great performance I am really enjoying my new Linksys WRT3200ACM router. Internet connection speeds are the best. My laptop is connecting to the router at 1170Mbps (the best I’ve ever seen). Our various wireless devices are used throughout the house and we haven’t experienced any dead zones. We maintain good connection speeds everywhere. I have Apple TV and a Blu-ray player connected via Ethernet to the router. I have not experienced any lag or buffering, just smooth video. I also have external storage connected to the USB 3.0 port. Gaming is also superb on the router. My ping times are great and I get excellent play. I am very pleased with the performance of this router! Rated 5 out of 5 by mrmcnuggett from Great so far! I hooked this up this morning and everything is going great so far. Setup was smooth and easy as always. I have 16 devices hooked up and all are working flawlessly. My first time using a MIMO router and I already know it's sending signals way faster than my last Linksys router. It's only been a day but I am sure that this router will work great like all the others I have purchased from Linksys. I would definitely suggest this to anyone that wants their home network to be super fast. I received this as a promotion to try out for free with my review from Linksys. Rated 5 out of 5 by Ty25 from Great for long distances This WRT router performed very well for my household it handled all my devices without a sweat. My Xbox is 86 ft. away in a straight line with many double thick walls between it and the router. A detailed network test on the Xbox said it has around 46% connection strength. It still plays just fine. The Linksys smart WiFi app makes setting up and managing this router a breeze. It gives you instant access to a lot of important settings. I haven’t used any of the other features this router has so I can’t really comment on them. Finally this is great router it did everything and more than I expected it to. I like the throwback look of original Linksys wireless G.
Rated 1 out of 5 by Aairon1959 from NOT open source ready! I brought this device thinking I could use DD-WRT or Other popular open source firmware but all users such as myself are stuck with a router that doesn't work on the wifi side Linksys refused to release their present driver as Open source. Without a open driver this unit will NEVER work as Advertised. Rated 5 out of 5 by Irken Skoodge from Great Wireless Range and Speed Setup was a breeze. Once I connected to the router with the provided password I was easily able to connect the router to my Linksys Smart WiFi account and set up the router password as well as change the name of the WiFi bands. The interface for the router is very easy to navigate and provides you with many options that are useful in any network. There are features for device priority, device names, dns settings, and even open vpn. The router even supports DD-WRT and OpenWRT firmware it you want. The wireless range is also great. It covers my entire house. I get signal all over and its a strong signal. I love the design of the WRT line of routers too, it keeps the look of the orignal model. Overall this is a really great router if your looking for fast wireless speeds and lots of features. Rated 5 out of 5 by Drew from Blistering Speed! WRT3200ACM 2.6 Gbps Wi-Fi The WRT3200ACM is the latest Linksys router featuring the capability to use open source firmware. Always a favorite for advanced users that like nearly unlimited customization. This router has next generation 2.6 Gbps Wi-Fi speeds using Tri-Stream 160 technology. Linksys is able to bond the 5 GHz band and double the throughput of older routers. Something interesting we noticed is that the 5 GHz band seemed very fast on our mobile devices and tablets. We are thinking that Linksys optimized the 5 GHz band overall. Buy this router if you operate multiple devices on your network. Linksys has the secret sauce that enables each device to get the fastest speed possible. Along with legendary support and reliability, you have a winner! Rated 5 out of 5 by skelsey1 from Fastest router around!!! This router is hands down the fastest I have used before!! The signal is strong, even in congested areas like condominiums, where multiple wireless routers are broadcasting their signals. Setup was very easy, after I worked through an initial issue. I tried the setup in its manual mode, which it didn't like very much. The Internet light was amber instead of white, so I reset the router and followed the Guided Setup. It was very quick and easy, and after I was able to make the customizations I wanted after. Speed is amazing!!!!! With multiple people surfing the web, Instagram, and YouTube, I was still able to get over 300Mbps over wireless with no problem!!! I highly recommend this router, as its another quality device from Linksys. Rated 5 out of 5 by Timmoyles from Speedy Router Received my new WRT3200ACM router today, was plugged in and operating well within ten minutes. The default router setup provides both a strong and secure setup for my wireless connections. Besides running laptops and Ipads we have Iphones and Android tablets. All these devices seem to be perform well with this router. The dual core processor and 512MB ram provides very quick response to apply change of settings and to reboot device. This router is customizeable with OpenWRT and DD-WRT to tweak setup for special operation and functionality. Rated 1 out of 5 by phil from Weak wifi radio, don't buy for Wi-Fi... Look elsewhere if you want a wifi router with any range. This router only works at near-full wifi speed within 10 feet of the unit (720Mbps max). Its radio is very weak. At 20 feet it has a maximum connection speed of 200Mbps. Outside that you get between 5-30Mbps. I'm running the latest firmware and have no interference issues. I've worked with Linksys customer support. I've even returned/replaced this router thinking I got a bad one. This router does NOT support 2.6Gbps speeds (or even 500Mbps speeds), it does NOT support "beam forming". It does NOT even support "tri-stream". I have no idea why all this is in the specs and printed on the box. On the plus side... This router has the fastest wired file transfer speeds I have every seen. Just don't try to use it for wifi. Rated 5 out of 5 by aircuellar from Excellent The packaging is outstanding. Unboxing was like opening a Christmas present. The router and antennae look like they are made much more high quality than EA6900 and all the other routers I have owned and seen. Setup was a breeze. Web interface looks a lot like the EA6900 but with additional options. The range is much better than EA6900. The Best part is that I can now stream media to my Galaxy S7 with MU-MIMO on 5 GHZ, Sony Blu-Ray 2.5GHz, and my Speed test to my Wireless AC 5GHz on my HP laptop at the same data rate, as when I had it hardwired to the LAN using Cat7 cable. Does EXACTLY as advertised! It is completely future proofed. I am going to make sure all my upgrades are have MU-MIMO.